The post is made by “ThrowAwayForPancakes” user who said he overheard a man threaten his date at a restaurant. He said the man was being obscene and obnoxious. He was not one to usually step into things like this, but he decided he would. Just as he was getting up, another man – someone a little older – tapped him on the shoulder and said he’d take care of it. 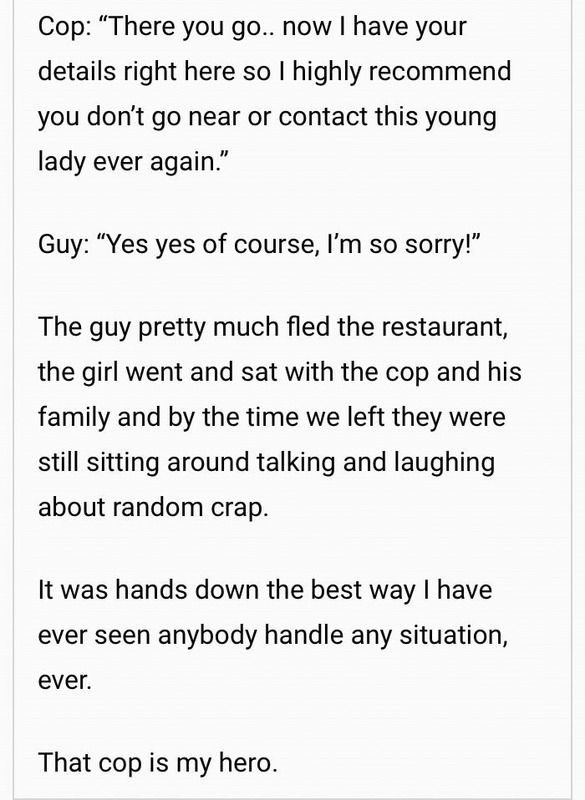 As the story goes, the man was having dinner with his girlfriend, and the couple in the incident were sitting behind him. You could tell things were not going well. The guy was creepy and saying some pretty vile things. The girl was definitely not comfortable being there. She quickly eats her appetizer, which the man notices and says, at least he knows she can swallow. The girl gets red in the face and makes it known that she doesn’t like that comment. He waves his hand to dismiss it and replies that she needs to calm down, he’d been finding out later that night anyway. The writer didn’t know exactly what she said, but it was certainly with the “f-words” dropping. Whatever she told him, the man reminded her that he picked her up and knew where she lived. With that, she stopped and lost all color in her face. Although the writer wrote that he doesn’t get involved, he was young and fighting-ready if he had to. He said another man – in his 50s tapped him on his shoulder and said he got this. He goes to the couple’s table, grabs a chair nearby and flips it around. Then, he does something amazing. The writer said he pulled out a cop ID. Now, it’s the male date that has no color in his face. 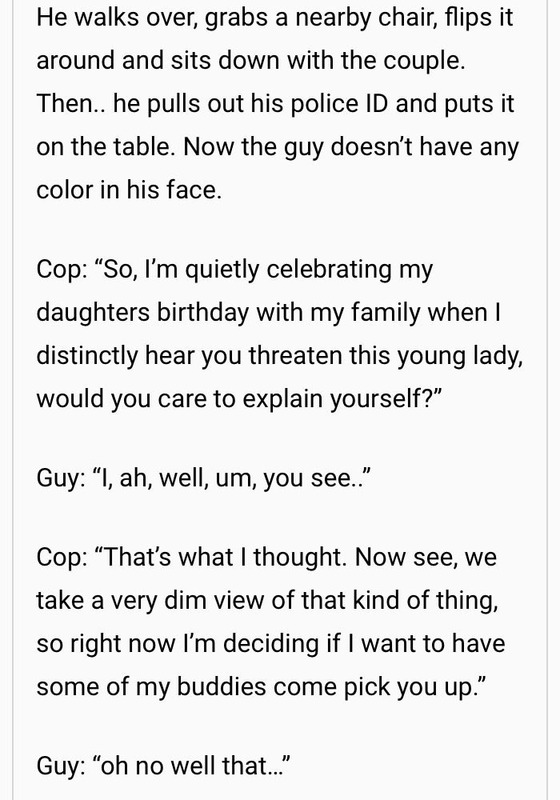 He goes on to say that he was celebrating his daughter’s birthday in the restaurant and that he overheard him threatening the young lady. He asked the man if he’d like to explain what he meant by what he said. The guy was at a loss for words. The cop went on to say that since he had no real explanation, he had a narrow view of what he meant and he was trying to decide if it were best to contact his fellow officers. The man continued to stammer on. The cop said that would be a disruption to everybody’s meal. He asked for the man’s ID to ensure he didn’t run off on him. He suggested the man pay his bill – the entire bill – for his ID. He said the young lady doesn’t need to go hungry because he was a bad date. The young man, finally with words, said he’d pay the bill right away. 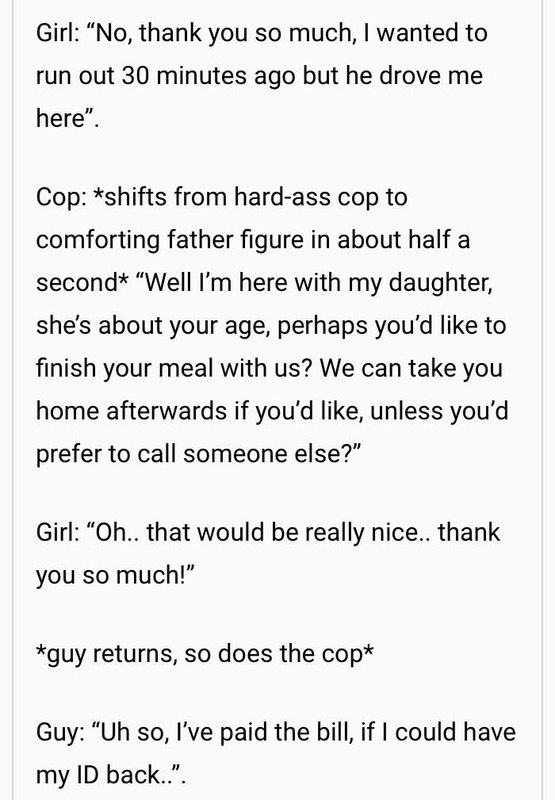 While he was gone, the cop suggested the young lady come to his table to eat out the rest of her meal. The cop said he could tell she was uncomfortable, which is what prompted him to come over and step in. 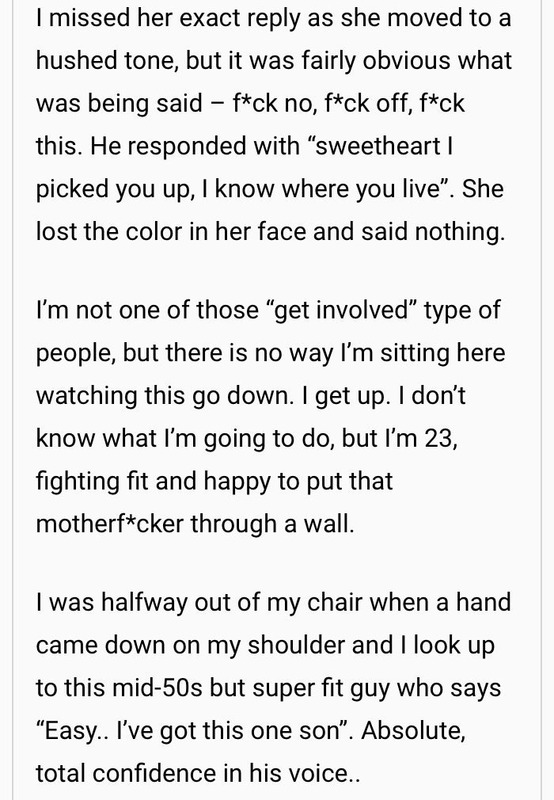 He also told her if she wanted to pursue the matter, he’d be more than happy to have his buddies to stop him on his way home and pick him up. She thanks him for his help. 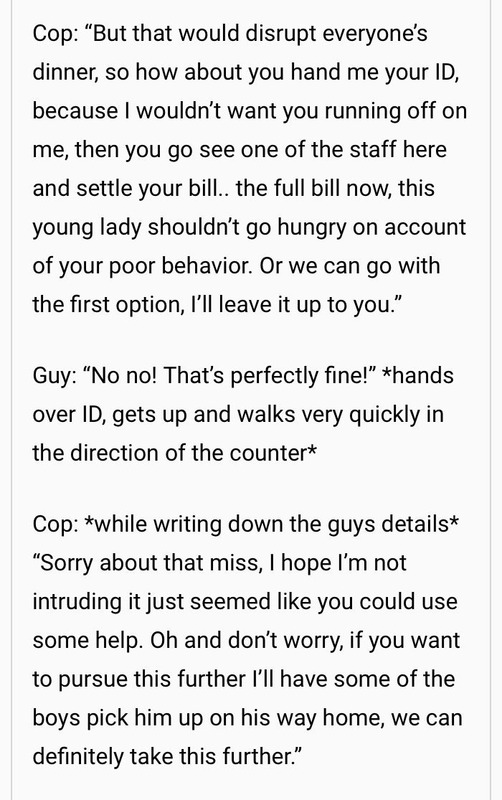 When the guy came back for his ID, the cop said he had the man’s information and suggested he not contact the young lady ever again. The man, still scared, said he wouldn’t and ran out the restaurant. The girl went to sit with the cop and his family for the rest of the meal. 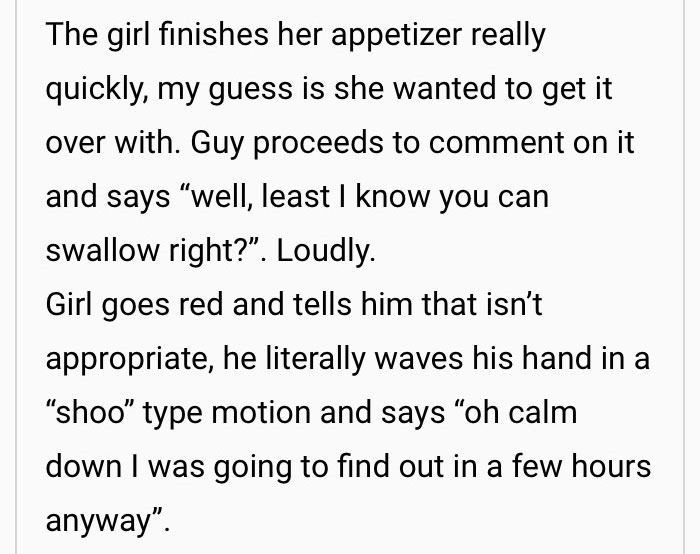 The writer said it was the best encounter he’d ever seen at a restaurant. The cop, he said, was his hero.